NOTE: This episode takes place on their way to meet Colonel Mustang....right after they burned their house down. While the boys wait at the station for their connecting train, they are forced to use alchemy to apprehend a thief. A constable on duty is impressed and tells them of a man who also uses alchemy called Majhal. The officer continued by saying that Majhal lives in a village nearby, but that village has been experiencing trouble such as the dead coming back to life and attacking the residents.�On their way to that village, Ed informs Al that he's heard of this man from one of their father's letters. 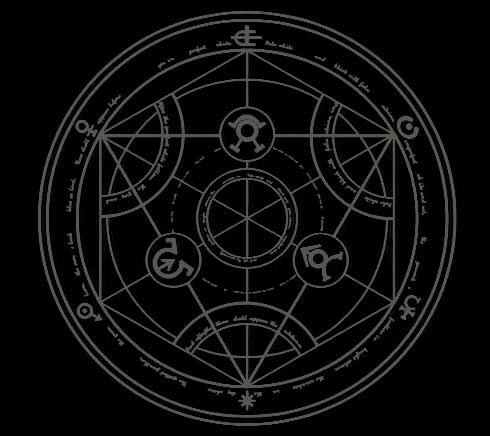 It had something to do with human transmutation. As they approach Majhal's home, the boys are involved in a confrontation with some village kids. One of them is a feisty young girl dressed as a boy whose name is Klose. Majhal breaks up the confrontation and takes the two boys to his home. He is amazed how well Ed was able to affix Al's soul onto the armor. Ed asks the man about human transmutation. Majhal responds that it is forbidden and can only be performed by God. As they are talking, there is a knock at the door. An old woman (Lebi) brings jam made of roses to Majhal. It's not long after she leaves when there comes another knock. It's Klose and her father. He has brought her to apologize. When Majhal brings up her dead older sister, Klose becomes angry saying her sister was murdered, because "SHE" came back to life. The distraught young girl runs off into the night. It's a good thing Ed and Al chased after her for she tripped and would have fallen into a river, but Ed used alchemy to freeze the water. Afterwards, she told them how her sister was found dead. While at the funeral, her father saw a vision of Karin, a woman who used to live in the village. She asks them to help her seek revenge, but ED was against it. Klose grew angry and the two began calling each other names. Young Klose went home angry and frustrated. When the boys returned to Majhal's, they asked about this Karin person. He explained that 20 years ago she use to live in the village and was very beautiful. She was able to cultivate hard-to-grow blue roses. One day, Karin tried to bring those blue roses to the city in a wagon, but she fell off of a cliff along the way and died. Later, Ed tells Al that if any human transmutation was done, only Majhal would be capable of doing so. Ed suddenly hears something and begins to have his suspicions. Late that evening, Ed and Al venture into the graveyard where they once again run into Klose and the other village boys. They've come to do away with the Karin zombie. When she does appear, everyone but Klose is frightened. She goes charging after the figure. However, before the girl can get near, Majhal shows up pushing her out of the way and using alchemy to shoot flames at the ghostly Karin. Ed recognizes a familiar sound during her destruction. Once the figure is destroyed, a woman is seen in the shadows. It's Lust. She mutters under her breath how the man was nothing more than a second rate alchemist. A little while later, while Majhal is celebrating at a festival with the other villagers, Ed investigates the mansion. Surprisingly, the old woman shows up, as well as, Majhal. Somehow, Ed is knocked unconscious, but before he passes out he falls into a room with lots of mannequins that look just like Karin. A short time later, Ed wakes up. He and Al are bound together. Majhal says they have seen something they should not have. As it turns out, Majhal was using the souls of villagers to affix to dummies who looked exactly like his beloved Karin. It's not that easy he says and some of his subjects would wander around the village aimlessly. He admitted that Karin was the only woman he ever loved. After years of a broken heart he made the decision to use alchemy to revive Karin. When human transmutation proved impossible, he wanted to create something similar. Then he said he's going to have Ed help him , but the boy refused. Just then, Klose walks in. She came to say thank you but saw too much. Majhal knocks her out. The old woman tries to stop him, but Majhal harshly pushes her down an leaves with Klose. Al is able to break the chains that bind them. Ed checks the old woman and notices a blue rose in her hair. Before Majhal can harm Klose, Ed uses alchemy to burst into the room. He tells the man that Karin didn't die in the accident. She had amnesia for 20 years. When she regained her memory she came back. Sadly, Majhal will not even consider that this old woman could possibly be his Karin. He gets angry and creates a sword wielding it at Ed and Ledi. Al intervenes. The incidents that follow cause the sword to become airborne. It pierces Majhal through the chest on its way down. Still....in his dying breaths Majhal spews, "There is no way you could be Karin." The old woman screams in sorrowful frustration. Later, just before the boys board a carriage, they are approached by a pretty young girl who apologizes and tells them they were very good alchemist. At first they don't recognize her, but when they do, they tell her she looks much better that way. With tears in her eyes Klose waves goodbye to the boys that saved her life.